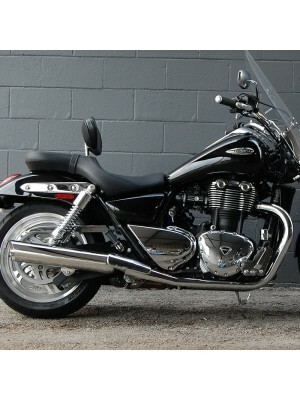 D&D Exhaust's Triumph Thunderbird slip-ons are designed to increase the power and performance of your bike. Get an immediate 10% increase in low-end Torque with D&D's Thunderbird slip-on. Our Slip-ons utilize stock heat shields and are a snap to install. We've modified the mounting so that they shoot out the back perpendicular to the rear wheel, giving it a custom look. Year: 2010-2014Make: TriumphDetails:2010-2013 Triumph Thunderbird Slip-onsNumber 557-12F.557-CAT cat..